Carol & Paul wanted a kitchen design that would be both functional and beautiful. After nine years of putting up with the kitchen they inherited when they bought the house, it was also important that it was a true reflection of their own style. "There was nothing particularly wrong with the last kitchen but I never really liked it", explained Carol. "It was cream high gloss and I found it a bit clinical looking and felt like I was forever wiping marks off the cabinetry". One other major requirement was that the space feel bright and airy and able to withstand the demands of busy life. Taking out the utility room and blocking up the existing back door meant they were able to open up the room, allowing space for a large central island in addition to the eight seater dining table and living area. Carol always wanted a wooden, country style kitchen so was excited about finally getting the chance to put her plans into action. Through careful research she discovered our retailer Ornan Kitchens, a well known quality kitchen manufacturer in Co.Meath. 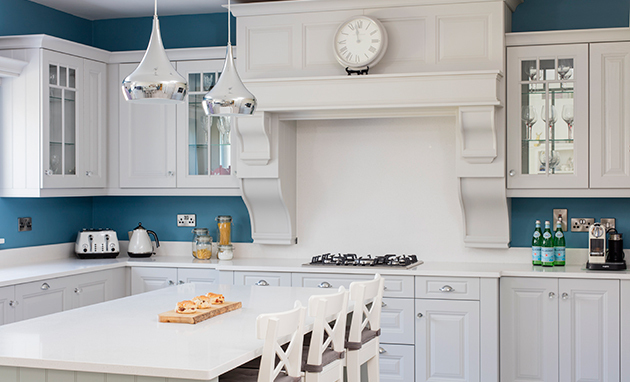 After a design consultation with Ornan, Carol chose our traditional Jefferson style range and went for a pale grey on the cabinetry, complemented with a light blue on the island unit and deeper tones on the walls. The tri-colour palette together with the mirrored backs of the glass wall units helps to make the room feel spacious and interesting. Carol's choice of silver pendant lights above the island also help to reflect light back into the room - even when they're not on. One of Carol's favourite features in the room is the custom-made overmantel above the gas hob. She said "The canopy is a real focal point in the room and I think it really shows off the quality and craftsmanship of the kitchen as a whole". Commenting on the finished kitchen Carol said, "I feel like I've been planning this kitchen in my head for nearly ten years so it's fantastic that it's now a reality! This is where we spend most of our time together as a family and I feel that, thanks to Ornan Kitchens and the Kitchen Stori brand which they sell, we've finally got a space that is exactly suited to us".